Before leaving the Canyon I'll say a few words about the Tarahumara Indians who live in this area. They have an ancient and complex culture. Today the Indian men are noted for their exceptional long distance running ability and both the men and women are noted for their superb crafts. 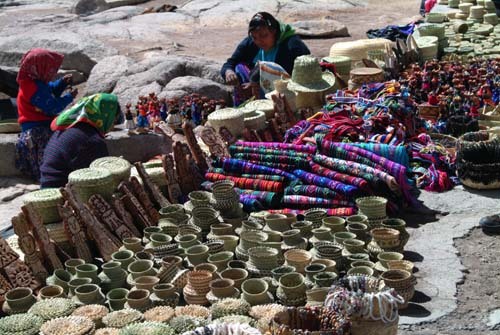 This one image gives an idea of some of the craft products that the Tarahumara create to market to tourists visiting Copper Canyon. The women are especially noted for their basket-weaving skills.